Late last week temps crept up above freezing for a day, giving those of us here in the North Country a break from the subzero cold. As a result some of the snow covering the ground turned to water. But when the cold returned, that water hardened into ice. I went for a short hike in the woods with my dog Matika yesterday despite afternoon highs in the single digits. Matika has a thick coat of fur so she didn’t mind it at all. But I had neglected to put on my thermals. More importantly, I had neglected to put on my Microspikes even though I now keep a pair in my car at all times. That made for some rough going. The trail beneath the thin veneer of snow was solid ice. I did not enjoy the walk. Nothing ruins an outing so effectively as constant slipping and the fear of falling down. 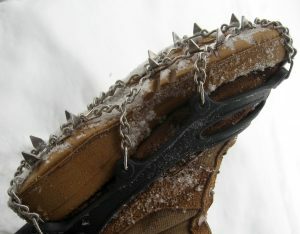 Not long ago I hiked Aldis Hill with the Microspikes over my boots and the icy trail was as easy to negotiate as bare ground. You’d think I’d learn. Well, from now until the spring thaw, I’ll make sure to have this highly effective piece of equipment on my person whenever I venture into the woods – in my pocket if not on my feet. I’m not gear-obsessed like some outdoors people are, but Microspikes are something that no hiker living in this frigid clime should be without. They are as important as snowshoes.